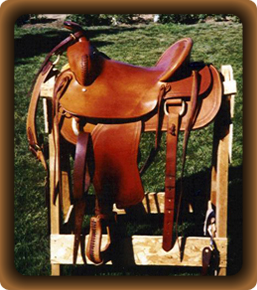 Natural skirting leather and brown latigo, leather stirrup covers, cantle and horn bindings. Design is a double crease border stamp on the fenders, skirts and jockeys. Included matching breast collar. 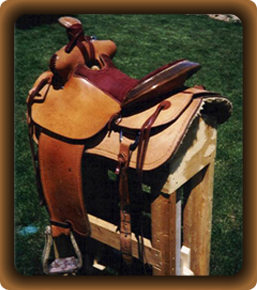 Natural skirting leather and burgundy latigo, natural rawhide stirrup covers, cantle and horn bindings. Has padded Burgundy suede seat and dee style rope strap. Design is a sunburst border stamp on the fenders, skirts and jockeys. Included matching breast collar and flank cinch. 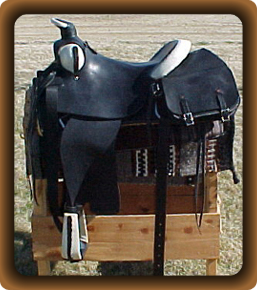 Skirting leather dyed black and black latigo, bleached rawhide stirrup covers, cantle and horn binding and swell cover. Saddle has no border or stamping. Included matching breast collar and flank cinch.